Fans of the Chicago Blackhawks covered the house of the team's coach in toilet paper to celebrate the team's victory over the Boston Bruins in the Stanley Cup on Monday. The series lasted six games, with the Blackhawks winning the sixth game in its final moments. Fans eagerly threw toilet paper all over the trees and yard of Blackhawks coach Joel Quenneville to celebrate the team's victory on Monday night. The coach took the event in stride according to reports, signing autographs and talking to fans even as his yard as covered in toilet paper. Many pictures have surfaced from the event and the day after, including photos of Quenneville cleaning up his yard. Fans who paraded around Quenneville's house took to Twitter and other social media to send pictures of their celebratory mayhem. The coach had all reason to take the event in stride after leading the Blackhawks to their second title under him in three years. He also had every reason to expect the toilet papering: the same thing happened when he brought the team to victory in 2010 against the Pittsburg Penguins, securing the Stanley Cup for Chicago for the first time in 49 years, according to Yahoo News. Like many sporting events, the Stanley Cup playoffs have a number of traditions associated with them. While covering the coach's house in toilet paper is only limited to Chicago, many other events are practiced across the country. 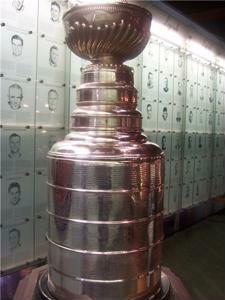 The Cup itself has several events associated with it. Starting in the 1930s, it became common for the victorious team to be presented with the trophy on the ice, where fans could watch. This actually did not become a mandatory part of the celebration until the 1950s, though it is now closely associated with the Stanley Cup, the Bleacher Report notes. Though superstition forbids players from touching the cup until it has been officially won, they are able to have plenty of fun with it once it has been. Every player on the team takes the trophy for a victory lap around the stadium after the game is over, and s given a day to have it during the off-season. The cup has been used as a cereal bowl, a beer cooler and even a dog food bowl by the players and team management who get to spend time with it.